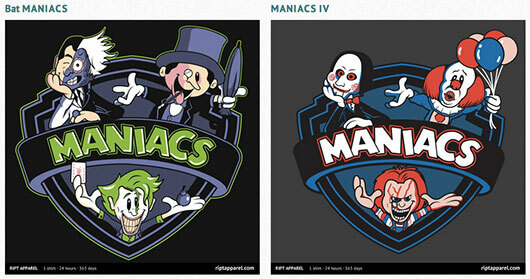 RIPT Apparel has two Animaniacs-inspired mash-up designs by RatiganProductions on sale today: “Bat MANIACS,” featuring Batman villains, and “MANIACS IV,” featuring famous horror movie killers. The shirts went on sale at RIPT today, Tuesday, October 8, 2013, at midnight CST, and will continue for 24 hours from then, and once it’s over, it will not be sold on the site anymore. The t-shirt is available in men’s (through 3XL), women’s, and youth sizes for $10 each. Kids sizes are $10 (Girls, Toddlers, and Onesies); Hoodies for $38 (in Men/Unisex sizes). See images on product page for shirt colors. You can also get the design on coasters for $25; iphone (4/4s & 5) cases for $18; prints 18″x24″ for $20 and 24″x32″ for $40; and headphones for $40. If you purchase both designs, you’ll save $1.